We all know that we are supposed to integrate several servings of fruits and vegetables into our diets every day. I personally love fruit (and I guess I also like some vegetables), but unfortunately I have found that it is not always easy to carry fruit with me when I am on the go. Dried fruit is definitely more portable, so I'm always on the lookout for interesting dried fruit options at the store. A while ago I blogged about Sensible Foods, which is one of my favorite dried fruit brands. Today I wanted to talk about a unique crunchy dried freeze dried fruit called Funky Monkey -- which distinguishes itself from many dried fruit options in two important ways: (1) the fruit has no added sugar so it is low calorie, and (2) the fruit is combined with other natural flavors (like cinnamon, lime juice, acai) that make it extremely yummy! Like you might expect from its name, three out of the four Funky Monkey flavors are centered around bananas (one of my favorite fruits!). The four flavors are: Organic Bananamon (freeze dried banana plus cinnamon), Organic Purple Funk (freeze dried banana plus Acai), Carnaval Mix (freeze dried banana, apple, papaya, and raisins), and for those of you that don't like bananas there is JavaLime (freeze dried pineapple with added lime juice). 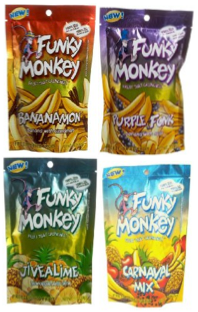 All of the Funky Monkey flavors are gluten free, wheat free, and dairy free and they do not contain any ingredients other than what I outlined above. So, not only are they yummy, but they are also very healthy as well (each flavor contains the vitamins and antioxidants that you'd expect, like Vitamin C and Iron). In particular, acai (found in the Organic Purple Funk flavor) is very popular right now, as may people are buzzing about its extremely high levels of antixodants which lead some to believe that it is an important disease-fighting fruit. A serving of Funky Monkey is pretty big (29g) and crunchy, and ranges from 110-120 calories, or 2 weight watchers points. I buy my Funky Monkey at Whole Foods (I am addicted to Bananamon). They are available in several other stores as well (you can check their website for details), and I also added them to the Yummy Diet Food Amazon Store. I haven't seen this anywhere! Looks like a great product. Would love to try it! I love fruits and I love dried things. I really appreciate your website. My girls love fresh fruit and prefer it over a baked supper. I often find that some fresh fruits don't travel well, but the dried fruits sound like an amazing alternative! Thank you for giving me ideas on healthy foods for my entire family. I really appreciate all the effort you put into this site. Thank you! This product looks great! Thank you for such a wonderful website.